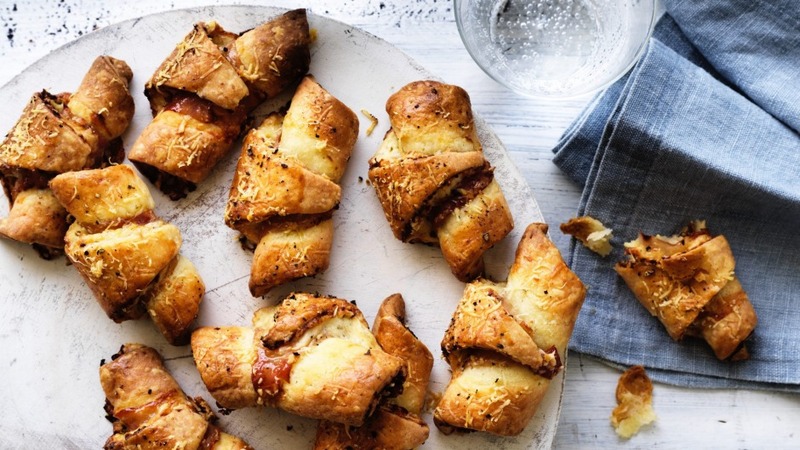 Do not be misled by the photo: these small pastries are surprisingly easy to make and taste 10 times better than ham and cheese croissants! Great for weekend brunch – but you'll soon be finding other excuses to make them. For a vegetarian option, swap the ham with leek, feta and za'atar, or an olive tapenade. 1. To make the pastry, place the flour, salt, baking powder and pecorino cheese in a food processor and blitz for about 15 seconds to combine. Add the butter cubes and process for a few more seconds until the mixture has the texture of fresh breadcrumbs. Add the cream cheese and process until the dough just begins to come together. 2. Tip the dough onto a lightly floured work surface and knead for a few seconds, just to bring it together. Divide the pastry in two, wrap each loosely in cling film, then press to flatten into two discs. Place in fridge for at least 1 hour, or up to 3 days. 4. Roll out one of the pastry discs on a lightly floured work surface to form a circle, roughly 28cm diameter and about 2mm thick. Spread half the mustard evenly over the entire surface, then scatter half of the grated cheddar cheese all over. Drape three slices of ham over the top, in a single layer, and trim away any excess. 5. Using a sharp knife, cut the circle as though you are slicing a round cake into 12 equal triangles. (Tip: cut first into quarters, then each quarter into thirds; and press down with the knife, don't drag it.) Roll each wedge quite tightly so that the filling is enclosed. Place on a lined baking tray, seam side down, spaced about 3cm apart. 6. Repeat the rolling process with the remaining disc of dough and filling. 7. Lightly brush the top of each crescent with the egg wash and sprinkle with the extra grated pecorino and black pepper. 8. Bake for 20 to 25 minutes, or until golden brown.